Heartstrings…..is in many respects a perfect introduction to Bauer’s work. 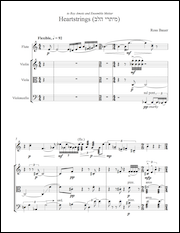 By turns breezy, dance-like, mesmerizing, occasionally edgy, sensuous and sinuous, it is particularly illustrative of the inclusive nature of Bauer’s melodic and harmonic language, seamlessly incorporating elements that strongly suggest tonality. It’s title notwithstanding, there is nothing obviously sentimental about Heartstrings. The Meitar Ensemble, for whom the work was composed, takes its name from the Hebrew word meaning "string.” Bauer was especially happy to have an opportunity to feature the group’s flutist, Roy Amotz, who, along with other members of group, plays with what the composer describes as a lot of heart. 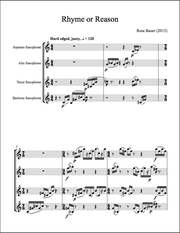 The Near Beyond, for clarinet, violin, viola, and cello, was composed during the Fall of 2005 (at the request of Laurie San Martin and Yu-Hui Chang) for Peter Josheff and Empyrean Ensemble. It’s dedicated to the memory of Lois Jones, an early and fervent supporter of Empyrean Ensemble, a friend of modern art of all kinds, and a warm and wonderful human being. Although there are some expressive moments, particularly near the end, The Near Beyond is not of an elegiac character. 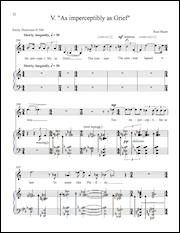 "The Waters Wrecked the Sky,” a song cycle for soprano and piano on five poems of Emily Dickinson, was composed during the summer of 2011. It was written for and is dedicated to Sarah Pelletier and Lois Shapiro. As with all of Dickinson's work, these poems are very musical -- both in the sound of their language, and in their construction. The poems I’ve chosen are linked by their nature/tree imagery, their clarity and concision, and their sometimes quiet, sometimes overt expression of ecstasy. "As imperceptibly as Grief" is the fifth and final song of the cycle. 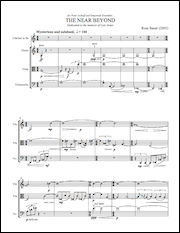 Rhyme or Reason for saxophone quartet was composed in 2013 and received it’s premiere from the h2 saxophone quartet on March 12, 2014 at the University of Oklahoma where they’re in residence. A playful one movement piece lasting around ten minutes, Rhyme or Reason explores a variety of saxophone textures and is influenced by my love of jazz and by my years as a jazz saxophonist.